GREATER Western Sydney has stuck with expectations by snaring Tom Boyd and Josh Kelly with the first two selections in the NAB AFL Draft, which is being held at the Gold Coast Convention and Exhibition Centre. St Kilda has also kept to the pre-draft script by selecting goal-kicking midfielder Jack Billings with pick three, as have the Western Bulldogs, who have gone for tall midfielder Marcus Bontempelli with selection four. It was also widely tipped that Tasmanian Kade Kolodjashnij would be taken by Gold Coast with pick five, and that mail proved spot-on. Collingwood then snapped up South Australian half-back Matthew Scharenberg, before the Brisbane Lions grabbed another Croweater, classy midfielder James Aish, with pick seven. Rounding out the top 10 were father-son selection Luke McDonald (North Melbourne), strong-marking midfielder Christian Salem (Melbourne) and speedy midfielder Nathan Freeman (Collingwood). Boyd, a 200cm and 104kg key forward from Melbourne's eastern suburbs, becomes the third No. 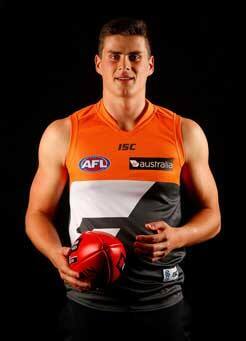 1 pick on the Giants' list, following in the footsteps of Jonathon Patton (2011) and Lachie Whitfield (2012). A strong and athletic 18-year-old, who has been compared to Geelong spearhead Tom Hawkins, Boyd had long been touted as the best player in the draft. "There's been a lot written, but until we get here, our names read out, it's hearsay and speculation, so I'm just super-excited to get started with the GWS Giants, who are obviously a budding and really exciting club," Boyd said after receiving his Giants jumper from new coach Leon Cameron. "I'm just really humble to be picked before some of these guys who I respect so much, and whose ability, in my opinion, probably supersedes my own in some regards." Boyd is set to form a formidable attacking set-up with Patton as Greater Western Sydney looks to climb the ladder under Cameron. "Look, I'm just willing to take the challenge head-on, and put my best foot forward," he said. "I'll be going to the Giants like any other player, and just trying to put my best foot forward on the training track and earn the respect of my teammates." Kelly, a skilful midfielder renowned for his aerobic capacity, is expected to immediately strengthen the Giants' running brigade. Like Boyd, he is 18 and from Melbourne, and he cemented his reputation as the best young midfielder in the nation by making the All Australian team at this year's national under-18 championships. Billings is regarded as a midfielder who can change the course of games. Back in July, he was named alongside Kelly in the under-18 All Australian side. Have your say on your club's draft haul. Tweet on draft night with the hashtag #afldraft and we'll publish the best responses.